REVIVAL - Large Wall Art (large wall decor) - Oil Painting On Canvas By Leonid Afremov - Size 30"x24"
I would like to present my hand painted oil on canvas painting (recreation) of the artwork REVIVAL . I made this piece with the same amount of soul and emotion just like the first original painting. This piece is created with oil paint on artistic canvas using my unique technique of a palette knife. The artwork has texture, you can feel the strokes by touching the painting. By purchasing on this site, you are buying directly from the artist Leonid Afremov. I guarantee your satisfaction and the best customer experience. We know Leonid Afremov as a prominent cityscape author that prefers quiet parks and noisy sidewalks to majestic forest and water views. This canvas is quite different, though. Here we can see Afremov adjusting his unique palette knife painting technique to a new artistic concept characterized by finer lines and subtler transitions of shades that can be observed in live nature. Instead of his usual rough color splashes, he uses delicate, carefully arranged strokes to replicate the sophisticated pattern of bare tree branches. While the foreground is painted in a very distinct, shape-conscious manner, the background is filled with random Impasto strokes creating a sense of rustling leafage and mist-covered mountains that look very Afremov. One should also note the mastery demonstrated by the artist while painting the sunset. The sky looks very vibrant and spectacular, yet soft, gentle, almost melancholic. The white splash of the sun is spilling out into the sky like an egg sizzling on a frying pan and pouring its glow all over the scene. 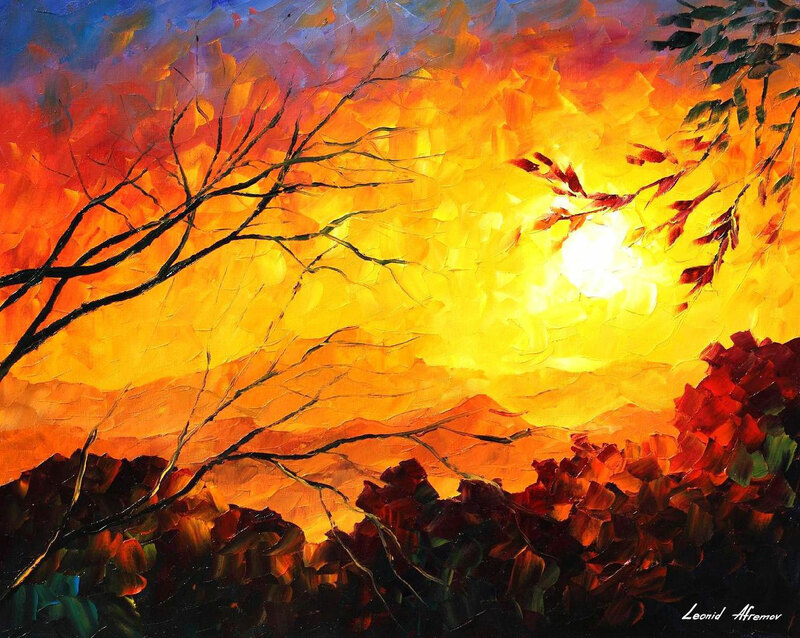 What differs this painting from other works by Leonid Afremov is the choice of colors. The landscape is basically created using only black, brown and shades of red, orange and yellow. There is a drop of green in the tree tops and some blue in the corner of the sky, which adds balance to the composition and refreshes the eye, but the main part of the artwork is painted in dark warm colors. That’s very uncommon for Afremov, with his motley cityscapes and great love for unexpected color combinations, but it makes the painting even more unique and appealing. Match it with pastel, brown or green walls, wood furniture or minimalistic room design. Set it off with bamboo curtains, reed sets in high vases, wood wall art or hunt-themed décor. Hang it in your bedroom to create a calm, peaceful atmosphere or use it in a dining room as an exquisite piece of large wall art. This beautiful and unique painting will add a sense of refinement to your interior design caressing the eye with delicate shapes and gentle colors. Fine art lovers will definitely appreciate its unique look and emotional appeal!